The TurboTax Blog > Tax Planning > Who Can File a Tax Form1040 EZ? Who Can File a Tax Form1040 EZ? Of those people who are required to file income taxes annually, the possible forms, in order, are Form 1040, Form 1040 A, and Form 1040 EZ. While Form 1040 EZ is the simplest and quickest to complete – and you can file this form for Free – it can only be used in very specific circumstances. Are you eligible for Form 1040 EZ? 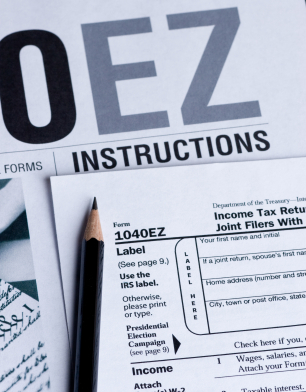 Here are the key considerations for filing Form 1040 EZ. There are five possible filing statuses. If you file as single or married filing jointly, you are eligible to use Form 1040 EZ. If you choose head of household, married filing separately, or are a qualifying widow with a dependent child, you’ll have to use either 1040 A or 1040. This is pretty simple. Do you have kids or a parent you take care of more than 50%? If so, since Form 1040 EZ does not allow you to claim any dependents, you’ll want to pick a different form. No adjustments to income are permitted on 1040 EZ. Common adjustments to income include the IRA deduction, the moving expense deduction, and alimony paid. If you experienced any of those expenses, or any other adjustment to income, you’ll want to pick a different form besides Form 1040 EZ. You can’t take the child tax credit, the dependent care credit, the foreign tax credit, or any other tax credit except the earned income tax credit on Form 1040 EZ. So while you shouldn’t let your eligibility for the Earned Income Tax Credit prevent you from using Form 1040 EZ, you have to use a different form if you qualify for any other tax credit. You must be under age 65 and not be blind to use Form 1040 EZ. It’s not actually blatant discrimination that prevents the elderly and those without sight from using Form 1040 EZ; it’s just that the form doesn’t provide for the ability to take the increased standard deductions those over age 65 and blind would otherwise receive. Only taxable incomes less than $100,00 can be processed using Form 1040 EZ. Any amount higher means you’re looking at filing Form 1040 A or Form 1040. It should be noted that if you otherwise qualify for Form 1040 EZ but for being over the income limit, your Form 1040 A or Form 1040 should still be relatively simple and painless to prepare. Form 1040 EZ is designed for straightforward tax situations. So if you won the lottery, ran your own business, or received a pension or any government payment besides unemployment income or Alaska permanent fund dividends, you’re out of consideration for Form 1040 EZ. Taxable scholarships and fellowship grants are allowed as is interest income, but only if the latter is under $1,500. Tips are only allowed if they are included in boxes 5 and 7 of Form W-2. In taxes, nothing is more straightforward than filing Form 1040 EZ. If you qualify, make your life simpler (and less expensive) by filing Form 1040 EZ. Don’t worry about figuring out which form to use, TurboTax makes figuring out which form to use easy by taking your information entered and putting it on the correct forms. The example of a six-figure income contains only five figures. Your software works better than this, fortunately! First time user of 1040EZ; anxious to see ow it works out. I used it last year and it was great! Used Turbo Tax last year and it was great! Why can’t I upload the 1040EZ for as your Turbo Tax Deluxe software tells me to do. I can’t e-file a 1040EZ form with software that I spent 49.00 dollars for. Your software is either not designed correctly or misleading. It won’t let me e-file at all. Because I don’t meet the tax requirements of using the long form. No were on your site, do you have the download that your software indicated that you had to upload so I can file electronically. 2nd year in a row I have started out under EZ (free) edition only to get to the end and Turbo Tax tries to charge me $29.99 for a $3.00 tax refun on an EZ form. I am currently number 95 in line to talk with a rep. The frustration is really setting in. I cannot access the FREE edition!!! Very frustrating!!!!!!!!! advertises “FREE” filing. What happened? Thank you for providing this free Federal Tax Return. It’s great for fixed and low income people. It’s good advertising as well as good customer service/relations on your part, so it’s a win-win situation for everyone. I very much appreciate it. To much junk to go through. They advertise a free choice but there is no way to access it that I can see. I know I’ve used it before. Just another rip off I guess. I am having the same problem. I’ve tried for over an hour …. VERY frustrating to say the least!!! Yup – First time for me using Turbo Tax. I paid the 34.99 which turned into 74.98 with my state tax but I paid it just to get it over with. can I use the 1040EZ if I made contributions to a 401K program?